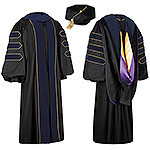 The Windsor package represents the best in fine quality regalia with a black Prestige Crepe fabric gown with your choice of black or degree-colored velvet chevrons and floating front panels with your choice of black, degree-color, gold or silver metallic piping. Features include a pleated yoke with fluting on the shoulders and back, piping on neck edge, and decorative regal braid and button on back yoke. Gown also features satin-lined sleeves with French cuffs and pockets and access on both sides. The package includes velvet 8-sided tam in a choice of black or royal with a choice of gold or silver bullion tassel, and a classic hood with degree-color velvet and satin lining in school colors.